Delicious and wistful Indian food menu is the recognition of Bombay by the Bay restaurant that offers a beachside view and cosy atmosphere to its valuable guests in Dubai Marina, Dubai. Dedicated team of chefs prepares mouth-watering delicacies of India at this venue, which are cooked to perfection. This leaves the guests craving for more. The restaurant also has an excellent interior apart from food, as it is delicately done. It can be judged from the funky outdoor area of Bombay by the Bay, which is quite colourful and has hanging upturned umbrellas. People of Dubai can hang out at this venue quite comfortably with their families, as this is a family friendly eatery that offers a number of services to make it an amazing dining experience for its guests. Bombay by the Bay serves cuisine of India, which includes vegetarian dishes as well. These nostalgic and scrumptious Indian fares at this bistro are prepared from traditional cooking methods that will leave the guests asking for more. 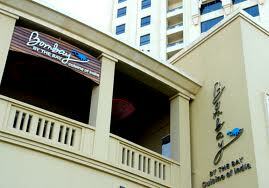 In addition to this Bombay by the Bay also have some subtle dishes that do not contain typical chilly hot Indian spices. The menu of this place boosts coolers, soups, salads, appetizers, traditionals, tawa tak a tak, seafood delicacies, tandoori delights, signature curries, exotic combinations, vegetarian selection, hot oven varieties, desserts and much more. Business lunch and carry out services are also offered at this eating place, which makes it even more favourite among the locals and tourists. The menu of Bombay by the Bay is wide-ranging and to see it click here! The opening hours for lunch at this bistro are from noon till 3:00 pm and dinner orders are taken between 6:00 pm and 11:15 pm. "The Walk" in Jumeirah Beach Residence, Dubai, United Arab Emirates. Bombay by the Bay is more than 2.5 kilometres walk from the nearest metro station therefore best alternative to reach this restaurant is by bus or car. 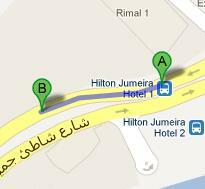 Hilton Jumeira Hotel 1 – Dubai bus stop is 130 metres walk from the Bombay by the Bay and it will take about 2 minutes to finish this journey. Bus number 8 have stops at this bus station and after reaching this site a passenger should head in the west direction on Jumeirah Beach Road, if he or she wants to reach Bombay by the Bay that can be found 130 meters away on the right side. See the map for directions.